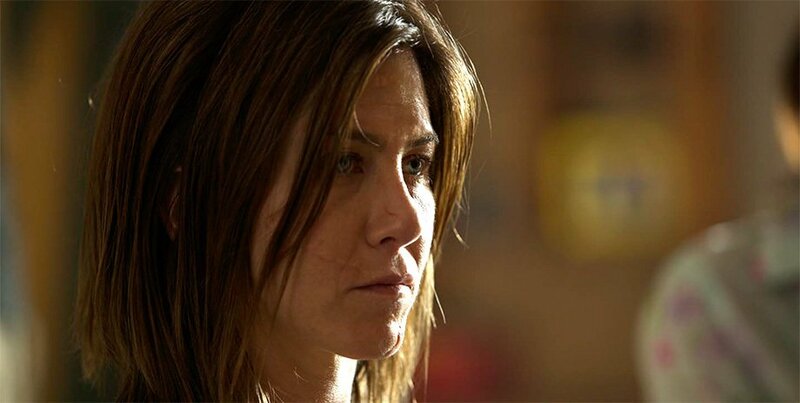 Jennifer Aniston gives the performance of her career as Claire, a woman on the brink of total self destruction following horrific car crash. Using bitter and dark humor as a self defense mechanism to pass the hours of day, Claire must force herself to face the truth of her situation. Every moment is excruciating pain, both physically and emotionally. Pills and alcohol are her God. It’s easier than feeling. When she is booted from her Chronic Pain support group after lashing out about fellow member Nina’s suicide, she embarks on a twisted journey to understand the young woman’s last moments. Fueled by anger and resentment, she fails to realize her similar track. Her tolerance for her situation is quickly waning. Will she give into the ghosts that haunt her? Aniston is beautiful through the drastically scarred body of Claire. The quiet moments are some of the most poignant and Aniston’s eyes speak volumes. The fine line between resentment and blame reach out of the screen and grab you by the throat. Often times making it gut wrenching to watch this woman self-destruct. But the real question remains, can you blame her? Adriana Barraza plays Silvana, Claire’s full-time care taker and enabler. She is elegant in her heartfelt role as mother figure who takes mostly grief form her employer. Underpaid and perhaps under appreciated, Barraza’s role is key in this story. As chauffeur and nurse, her kindness shines through in every syllable, willing Claire to makeit through another day as healthy as possible. Anna Kendrick plays the vision of Nina that follows Claire from moment to moment along her journey. Cutting and oftentimes vindictive, Kendrick gives a performance that should be noticed. These are the roles that show her true range. 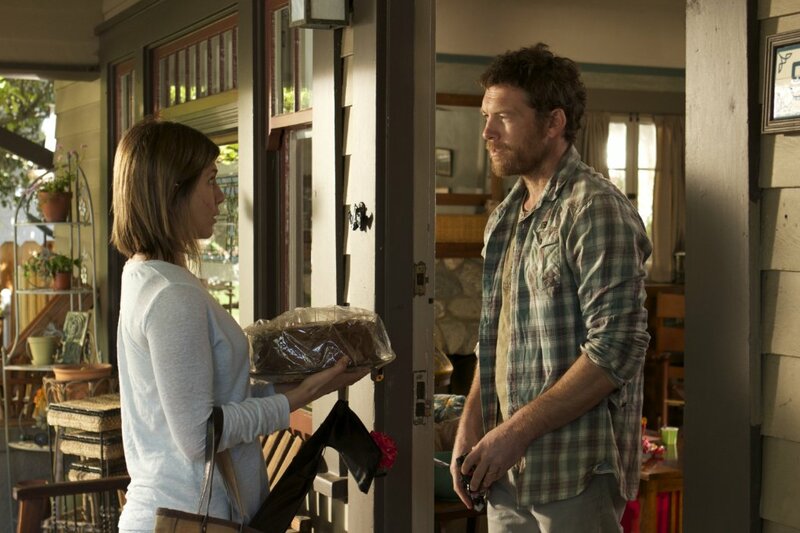 Sam Worthington drops his usual tough guy act to play Nina’s husband. His honesty and subtlety are magic as the coping spouse left behind. The chemistry between Aniston and Worthington is incredibly believable. They need each other. I would be remiss to ignore the brief but powerful scenes with Felicity Huffman and William H Macy. Both actors nail it every beat. CAKE is a true masterpiece. 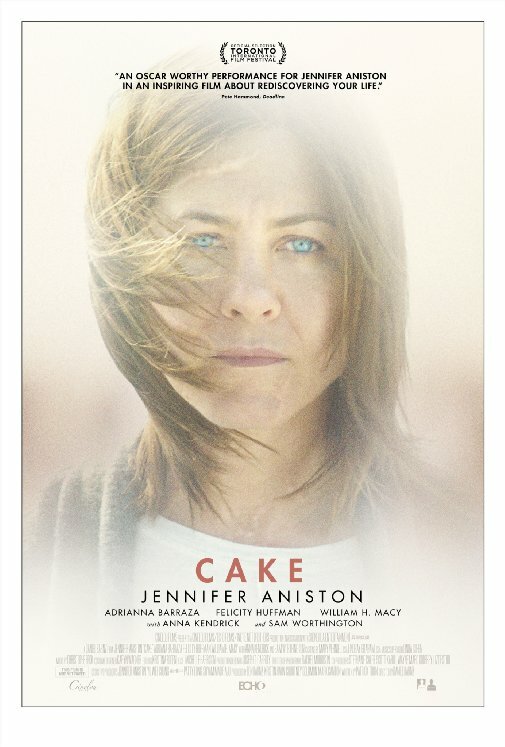 I shudder to think that Aniston was not nominated for this role. It is a true travesty. With a gorgeous score and stunning cinematography,this film will touch the lives of so many people. I urge you to seek it out. CAKE opens in theaters today. This entry was posted in Features, Go To The Movies, in theaters, Liz, Oscars, Poster, Release, Reviews, Streaming, Trailer, What To Watch This Week, Woman Lead, Women in Film and tagged accident, Adriana Barraza, Anna Kendrick, award winning performance, CAKE, car crash, chronic pain, coping, Felicity Huffman, grief, January release, Jennifer Aniston, loss, Oscar snub, sam worthington, scars, william h macy by Liz Whittemore. Bookmark the permalink.